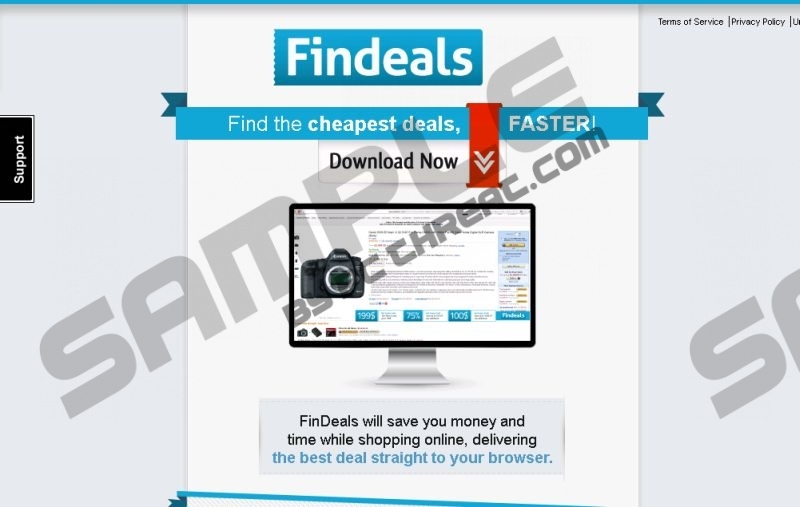 FinDeals is an adware program that is supposed to help you save money whenever you shop online. The application should display various discount offers related to your recent searches. However, there is no guarantee that FinDeals can provide you with reliable information. On the contrary, users are advised to remove FinDeals from their computers immediately because having adware applications on a personal computer is not safe. Please scan your system with the SpyHunter free scanner to search for more potentially unwanted programs. It is very likely that FinDeals hasn’t come alone. Our research specialists have found that FinDeals belongs to the Lyrics family of adware applications. This means that FinDeals is yet a new version of Looka Deal, Lyrics Fan, BetterOnlineDeals, and others. It is very peculiar that FinDeals does not have a direct download source. Although the program is promoted at findeals.net, the download button on the official homepage does not work. Thus, it is your first clue that this adware application is very far from being a legitimate and reliable program. It should be enough to prove that you should not trust FinDeals, but if you still think it is okay to leave this application be, let us carry on with our report. Now, if you cannot download FinDeals from findeals.net, how does it find its way to your computer? The answer is very simple: bundled downloads. Direct distribution is not the primary distribution method employed by various adware programs. FinDeals and other apps from the same group are mostly spread with freeware. For example, FinDeals might arrive bundled with Ad.Yieldmanager, Jollywallet, Xtendmedia, and so on. Ad.Yieldmanager is an annoying adware program that computer security specialists urge to remove at once. Hence, if FinDeals travels around with such a computer security threat, it should be obvious that it is not a reliable application. If you take a look at the official website, it says that FinDeals is free; it works with all major websites and finds the cheapest deals. Nevertheless, these promises are never kept because this adware app is not concerned with your online spending. It will display commercial advertisements, but chances are that they will not be as useful as FinDeals claims them to be. Quite the contrary, this app will rely on third-party advertising networks to embed its ads with unique content, and you have to remember that FinDeals does not review whether the third-party content is safe. Thus, the sooner you remove FinDeals from your computer, the better. Adware programs can lead to serious computer security issues, and you must avoid them. For full computer protection, do not hesitate to invest in a legitimate computer security application because the danger is always just around the corner. Drag the mouse cursor to the bottom right of your screen. Once the Charm bar appears, click Settings and go to Control Panel. Open Uninstall a program and remove FinDeals. Go to Uninstall a program and remove FinDeals. Navigate to Add or remove programs and uninstall FinDeals. Quick & tested solution for FinDeals removal.